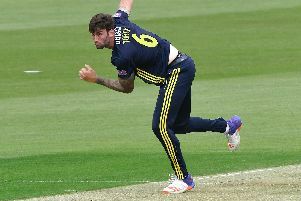 Hampshire’s campaign petered out with a home defeat at the hands of Lancashire on Wednesday. James Vince’s men suffered an eight-wicket defeat in the County Championship division one finale at the Ageas Bowl. Resuming with a lead of 92 runs and two second-innings wickets remaining, the hosts could only set Lancashire a target of 113 for victory. And the visitors breezed home in 13 overs for the loss of just two wickets. Keaton Jennings finished unbeaten on 40, while Lancashire skipper Liam Livingstone hit 48 not out. Fidel Edwards took both wickets to finish the season with 54 scalps in the top tier of the County Championship. 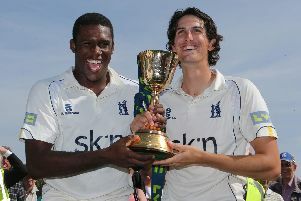 Hampshire said goodbye to Jimmy Adams and Sean Ervine this summer, while news emerged of Keith Barker’s arrival in 2019. Lewis McManus, who ended Hampshire’s second innings unbeaten on 44, said: ‘It wasn’t the ideal end to the season. ‘We wanted to send Jimmy and Slug off with a win at the end of the year. ‘There are plenty of things to improve but there have also been things which are good and we should take those positives. ‘It was nice to come into the game knowing we were safe. It gave us an element of freedom. ‘I wanted to go out and enjoy it. Some of my best performances have come when I have taken the pressure off myself. ‘It was good to spend some time out in the middle. ‘We thought if we could get a 150 to 200 lead then it might have been a tricky chase for them. Hampshire currently sit fourth in the division one table, although Surrey’s clash with Essex and Yorkshire’s scrap with Worcestershire are still in progress. Click here for the full scorecard from the clash, which brought the curtain down on Hampshire’s season.